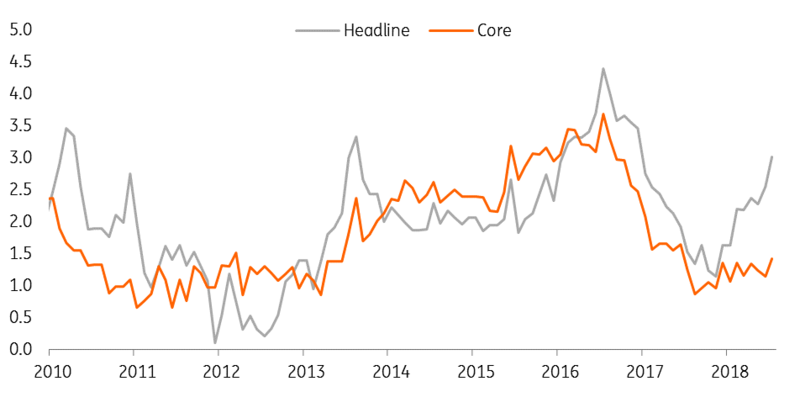 Headline inflation for July jumped to 3.0% (vs 2.6% in June, and consensus expectations of 2.6%), while core inflation also picked up to 1.4% (from 1.1% in June, and higher than expectations of 1.2%). This upside surprise was mainly down to higher energy and food prices. That’s in part due to rising oil prices. The exceptionally dry summer also plays a part in food price inflation and importantly pushes up electricity prices as hydropower plant reservoirs are running low, forcing production cutbacks and higher prices. Headline CPIF inflation remained at 2.2% in July, in line with expectations. 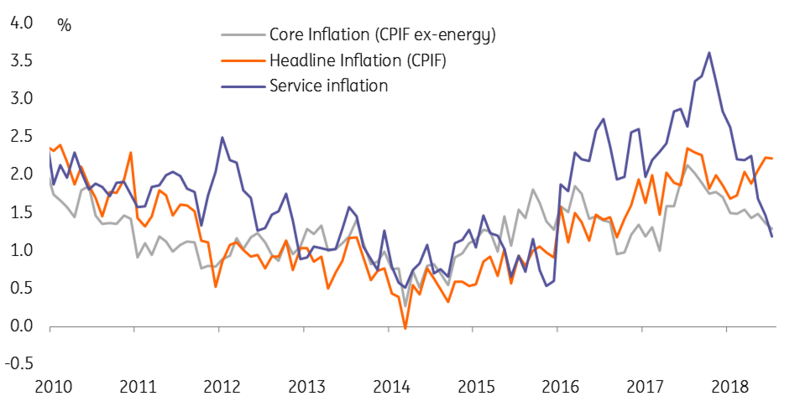 Core inflation fell to 1.3% (from 1.4% in June) and services price inflation, a key measure for the Riksbank, fell even further to 1.2% (from 1.5% in June). As in Norway, food and energy prices boosted inflation but were offset by weaker clothing and recreation prices. While the headline figure was a touch above the Riksbank’s forecast, core inflation was again about 0.15pp lower than the central bank’s forecast. Core inflation has come in weaker than the Riksbank’s forecast six months out of seven this year, which suggests yet another downward revision could be on the way at the Riksbank’s September meeting. Today’s data reinforces our view that monetary policy is likely to diverge in Scandinavia. Norwegian inflation looks to be on a slow but steady upward path, and Norges Bank is set to hike rates to 0.75% in September. This will likely be reiterated a the interim policy meeting next week. If the economy remains on track, we expect another hike in Q1 next year. The Riksbank, on the other hand, will see today’s inflation figures as a disappointment, and the dovish majority on the policy committee is likely to become even more cautious. If (as we expect) underlying inflation remains weak in the autumn and continues to undershoot the Riksbank's forecasts, then the Swedish central bank is likely to once more delay raising rates, pushing the first rate hike in 2019. While the current risk environment means that high-beta currencies like NOK and SEK struggle against the euro and dollar, we continue to see NOK as the better bet. We see NOK/SEK as likely to keep heading higher and look for the pair to eventually break through the 1.10 level as the divergence in the path of core inflation, and consequently in central bank policy is confirmed over the autumn.